Marianne Design Stamps Tiny's Chrysanthemum (Layering). This set of 12 stamps layer together to create a beautiful bouquet for chrysanthemums. The designes that result from the layering process are lovely and detailed. Size: 4.5 x 6 in. Marianne Design Layering Stamps Tiny's Helleborus. This set of 17 stamps are designed to be layered together using different colours to design a hand drawn realistic flower. Approximate size of finished flower: 1.75 x 1.75 inches. Marianne Design: Clear Stamp Set - Tiny's Hydrangea (layering). 1 layer with contour lines for colouring. 2 styles of hydrangea flowers. Each style has 4 layering stamps to create realistic looking flowers with depth and dimension. Comes with 4 layers of hydrangea leaves as well. Follow simple instructions on the back of the package. 12 stamps. Smallest:leaves: 1" x 3/4", flowers: 1 1/2" x 1 1/2". Largest: flowers: 1 3/4" x 1 1/2". Stamp realistic sunflowers by layering these stamps in order to add varied colours to your design. 15 pcs; 4.3 x 5.9in. Cling rubber stamps featuring tropical flowers and the word "Aloha". These detailed stamps are the perfect way to add fun images to your cards, scrapbook pages and more! Use with any clear acrylic block. Known for its delicate beauty, exceptional scent and use in Hawaiian tropical leis, the plumeria flower is one of the most recognizable of the tropical hot spot florals. Ideal for embellishing in mesmerizing hues of rich pinks, soft whites, bright yellows and rich reds, these stunning hand stamped and hand shaped equatorial paper blossoms will bring a realistic touch of the tropics to any hot spot themed card, scrapbook layout or altered art creation! 1. Large Plumeria Petal Cluster: 2.75" x 2.0", 2. Medium Plumeria Petal Cluster: 4.25" x 2.5", 3. Small Plumeria Petal Cluster: 3.75" x 1.75", 4. Extra Small Plumeria Petal Cluster: 3.0" x 1.75". These cling stamps are ready to use with Acrylic Blocks. Included with stamp set: 1. Storage panel for use with a two or three ring binder 2. Stamp packaging can also be used as a storage box for the stamp(s). 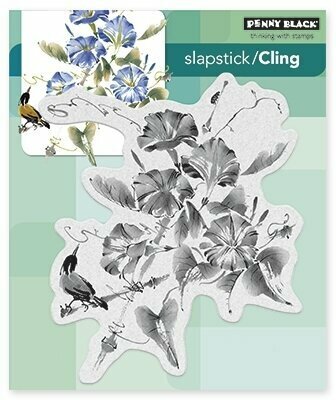 Penny Black slapstick cling stamp featuring a bird with flowers. Penny Black slapstick cling stamp featuring tulips. Clear stamps featuring flowers, borders, and birds. 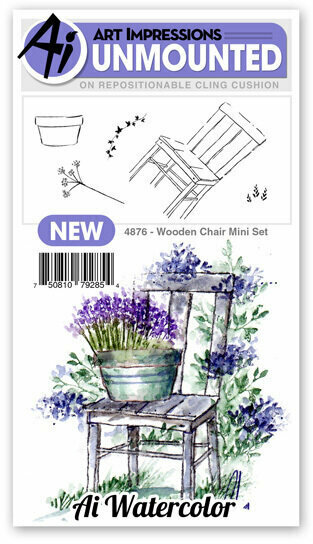 This new WC Mini Set includes a wooden chair, small flower pot, queen anne's lace, and tiny hyacinths. ***Colored image on the packaging is for inspiration and may use stamps from other sets. The stamps included are the black silhouette images. Cling Stamp from Impression Obsession featuring a Wild Sweetheart Rose. 4x8 stamp set with 17 pieces designed to use with watercolors or markers. Large 5 petal flower measures approximately 2 1/2" x 2 1/4". Small 8 petal flowers measures approximately 5/8". Delicate and dainty, these graceful drooping florals are the perfect addition to any fairy garden themed creation! A wonderful assortment of varying sized blossoms allow you to build the perfectly sized flowers required, from double blossoms to buds to gorgeous single blooms! Various sizes of greenery sprays are the perfect finishing touches to complete elegant floral scenes and bouquets. Beautiful and eye catching in any color, these dainty accents are ideal to use with any of your favorite collections! This cling stamp set is part of the Wildwood Cottage Collection and pairs with the Wildwood Florals Die. 1. Vining Floral Cluster: 2.5" x 1.25", 2. Drooping Floral Stem: 2.0" x 2.25", 3. Drooping Greenery Stem: 2.0" x 1.75", 4. Vining Greenery Stem: 1.25" x 2.0", 5. Leaf Cluster: 1.5" x 1.5", 6. Mini Blossom Layers: 1.75" x 2.75", 7. Large Blossom Layers: 2.5" x 2.5". Add interest to window scenes with the petite flowers, foliage and branches found within the Window Box Fillers Cling Stamp Set. Pair with the coordinating dies and opt to use the delicate floral accents to fill a dimensional window box, or mask and stamp images directly onto cards or scrapbook layouts creating your very own bouquets and beautiful borders. A wonderful and versatile assortment of blossoms and greenery to use as fillers with all previous and upcoming collections! This cling stamp set is part of the Winter's Eve Collection and pairs with the Window Box Fillers Die. Approximate Image Sizes: 1. Flowers Pointed Petals: 2.5" x 2.5", 2. Flowers Rounded Petals: 2.25" x 2.0", 3. Foliage with Berries: 2.25" x 1.75", 4. Branch: 2.5" x 2.0", 5. Leafy Branch 1: 2.25" x 2.25", 6. Leafy Branch 2: 2.5" x 1.75". These cling stamps are ready to use with our Acrylic Blocks. Included with stamp set: 1. Storage panel for use with a two or three ring binder, 2. Stamp packaging can also be used as a storage box for the stamp(s).